One of America’s best funny motivational speakers, Jeff brings his corporate brand of humor to entertain and revitalize the workplace. He blends his expertise as a clean stand-up comedian, improvisational actor and award-winning comedy coach into dynamic, laugh-packed keynote presentations and workshops. 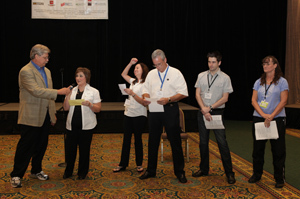 Programs are tailored to your attendees, amount of time allotted and the event. Material is tied into your theme. Programs focus on the issues that are important to your participants. 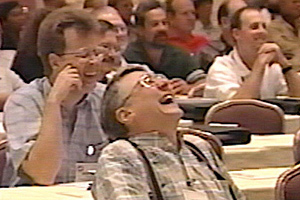 You decide the proper mix of humor and content for your meeting. With the delivery of a stand-up comedian and the insight of an award-winning trainer, Jeff captivates his audiences with his unique blend of humor, message and magic combined with hilarious audience participation and a show-stopping finale that will have your attendees on their feet and cheering! If one of your aims for your meeting or conference is to help your attendees deal with these stressful times, you want a keynote speaker with experience and up-to-date content. What if you could find a fun motivational keynote speaker who would engage your participants with laughter and audience participation while delivering his message? 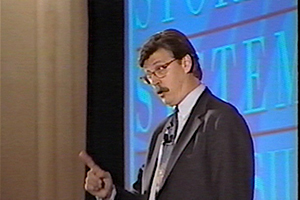 Jeff Justice is the perfect keynote speaker with a combination of rich content and great clean humor. He will connect with your audience and leave them laughing, motivated and better able to deal with the daily onslaught of stress in their lives. If you’re looking for a clean, funny, keynote humorist to guarantee your next meeting is a huge success then motivational humorist Jeff Justice is your guy. Your audience will laugh while they learn how to use humor appropriately for relieving stress, dealing with clients, breaking down barriers and becoming more productive. It’s the perfect way in this stressed out economy to punch-up your meeting and jump-start participants with both great content and clean humor. They will understand how to take themselves lightly while taking their work seriously. 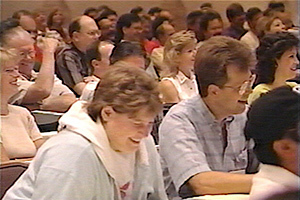 Jeff loves to sit in on the meetings before his presentation and develop even more targeted humor from listening to the other presenters. 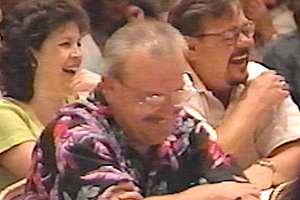 With the delivery of a stand-up comedian and the insight of an award-winning trainer, Jeff captivates his audiences with his unique blend of humor, message and magic combined with hilarious audience participation and a show-stopping finale that will have your attendees on their feet cheering and the boss looking like a star! 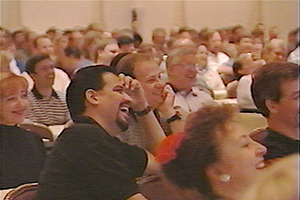 A funny Keynote Speaker, Executive Coach and Corporate Emcee his “Laugh More, Stress Less (and Avoid Getting Burned Out)” program is perfect for all types of functions from large conventions to management retreats during these stresful times. Call today and discover why Jeff’s clients, like AT&T, Coca Cola and IBM have this Corporate Comedian back time and time again.